Back at Christmas time I bought an insane amount of pre-peeled garlic due to poor grocery shopping planning, and needed something to do with it. I’d remembered a recipe they’d talked about on The Splendid Table a while back for homemade seasoned salt using fresh garlic, and decided that since I had a plethora of the stuff that I needed something to do with…this was the perfect opportunity to try out said recipe. You guys, it’s been pretty much the only seasoning I’ve used since then – save chili powder and cumin. Not a meal goes by that I don’t find myself dipping into the stuff. I keep a mason jar curing of it at all times, just because it’s so perfect to use on everything – any protein under the sun, to any vegetable or starch you can throw at it! It really heightens the flavor of whatever it is you use it on, without overwhelming it…which many store-bought seasoning blends tend to do! I roasted the garlic first – to intensify and deepen the flavors. Then, toss it into bunch of salt along with some freshly chopped herbs. Any mix of your favorite will do – I’ve been using rosemary and thyme recently, just because it’s been pretty readily available during the cold months. However now that it’s warming up and I’m starting to think about my herb garden – I’m looking forward to experimenting with different blends of herbs this season. I also think that bit of citrus zest would also be a welcome addition to the party! Or maybe a smidge of lavender for an Herbes de Provance twist? Have fun with it, you can’t mess this one up! Heat oven to 425 degrees. Place garlic in small baking dish and drizzle with olive oil. Place garlic in preheated oven for about 25 minutes, until brown on the edges and fragrant. Roughly chop and set aside. 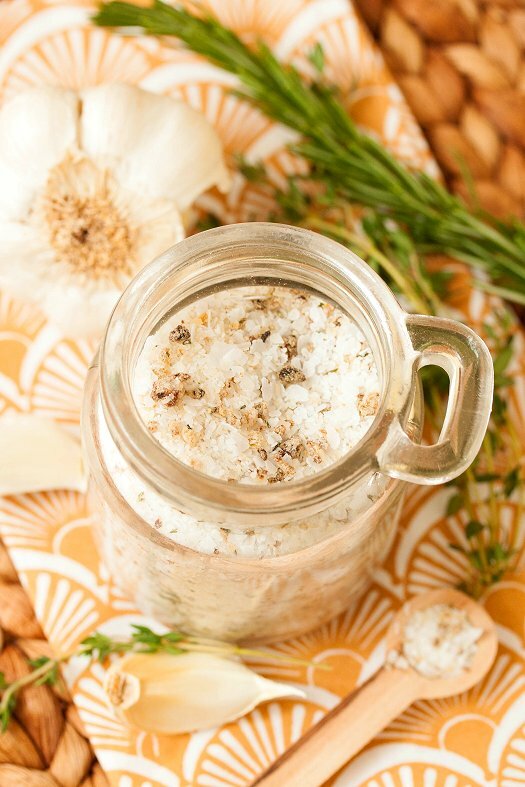 Combine kosher salt, roasted garlic, and herbs into a quart size mason jar. Seal with a lid and shake well to combine. Store in a dark space, shaking occasionally every other day or so, for about 5 days. Place salt infusion into a food processor and blend for a few pulses until garlic and herbs are mostly chopped and uniform. Place back into the mason jar or another airtight container for storage.